It was a crisp day and we were lucky that the rain held off – perfect for running rugby. Our opening game was against a mixed Barbarians team and the boys ran out winners by 5 tries to nil. Some of those tries were spectacular, with one in particular involving six or more free flowing passes to open up the Barbarians defence. It was a cracking start to the day, and we had to remember to keep our feet on the ground as we had some big games to come! Next up were Hawick and once again we kept a clean sheet whilst scoring 4 tries this time. This was a much tougher test than the first game and some aggressive rucking was what gave us our advantage. Again the boys moved the ball extremely well and the way they moved the Hawick defenders around was fantastic to watch. 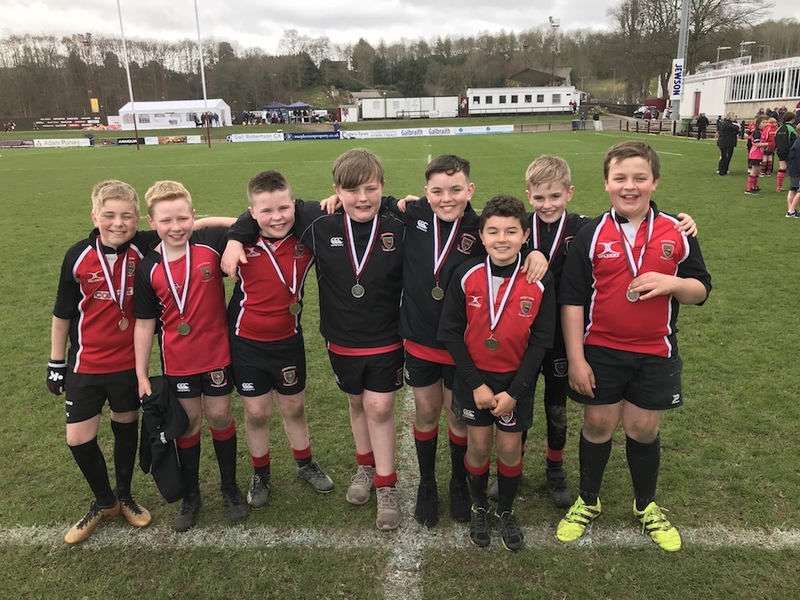 More of the same against West of Scotland resulted in a bundle of tries and led to another convincing win and set up the pool decider against Selkirk. They were a cracking team and approached the game in exactly the same way as we were, which resulted in a thrilling match. It was touch and go for much of it and in the last minute was balanced at 2 tries each…. then three cracking tackles in a row forced one of the Selkirk players to spill the ball… we pounced on it and raced half the length of the pitch to score in the corner! Our semi final was against the home team Gala. This was another cracking game and the boys once again got stuck in from the kick off and never have Gala a chance. We managed our defence perfectly and some strong tackling and rucking saw us win once again without conceding a score. Which was against a visiting team from Morpeth who contained some seriously big units! A few of them dwarfed even the largest in our team by a few inches. In addition to that they were a good team who were clearly well drilled and knew their stuff. Ultimately we lost the game 4 tries to a single score and Morpeth richly deserved the win… however that doesn’t tell the full story. We conceded the first score straight from kick off with one of their bigger players bathing through our defence, so we were always fighting an uphill battle. The boys stuck in well though and through some quick off loading we scored the only try that Morpeth had conceded all tournament. All in all this was a fantastic day for the P6 squad. A great brand of rugby was played all day and they were relentless in defence. We should also pass our congratulations to the P5 and P7 teams who went a step further and won their groups. The presentation was something for Linlithgow Rugby Club to be proud of with representation at every age group! Given the quality of the teams there that was a huge achievement for the club.